Monday Lotto numbers are drawn from a machine containing 45 balls numbered from 1 to 45 inclusive. For a standard game, you choose 6 numbers from this range. In total, 8 balls are drawn of which the first 6 are the winning numbers. The last 2 balls are the supplementary numbers. These supplementary balls are used to determine prizes in Divisions 2, 5 & 6. OZ Lotto numbers are drawn from a machine containing 45 balls, numbered from 1 to 45 inclusive. For a standard game, you choose 7 numbers from this range. In total, 9 balls are drawn of which the first 7 are the winning numbers. The last 2 balls are the supplementary numbers. These supplementary balls are used to determine prizes in Divisions 2, 4 and 7. Wednesday Lotto numbers are drawn from a machine containing 45 balls numbered from 1 to 45 inclusive. For a standard game, you choose 6 numbers from this range. In total, 8 balls are drawn of which the first 6 are the winning numbers. The last 2 balls are the supplementary numbers. These supplementary balls are used to determine prizes in Divisions 2, 5 & 6. For Powerball, 2 sets of numbers are drawn from 2 machines, first contains 40 balls numbered from 1 to 40 inclusive and the second one contains 20 balls numbered from 1 to 20 inclusive. For a standard game, you choose 6 numbers from the first range of 1 to 40 and a Powerball number from the second range of 1 to 20. In total, the machines draw 7 numbers. Firstly, the 6 winning numbers which are drawn from the first barrel of 40 numbers and secondly 1 Powerball number which is drawn from the second barrel of 20 numbers. Saturday Lotto numbers are drawn from a machine containing 45 balls numbered from 1 to 45 inclusive. For a standard game, you choose 6 numbers from this range. In total, 8 balls are drawn of which the first 6 are the winning numbers. The last 2 balls are the supplementary numbers. These supplementary balls are used to determine prizes in Divisions 2, 5 & 6. The Pools is based on Australian and European soccer matches. You don't need to know anything about Soccer though - it can be played just like a normal lottery game. Each week, 38 matches are listed and numbered 1 to 38 inclusive. For a standard game you choose 6 numbers from the range of 1 to 38. The 6 matches that accumulate to the highest total drawn scores are the winning numbers (e.g. Match A with a final score of 4-4 has a higher total score than Match B which finished 3-3). The 7th highest result is the supplementary number. Just like a raffle, each Lucky Lotteries Super Jackpot has a set number of ticket numbers to be sold (225,000). Once all are sold - i.e., the lottery has been fully subscribed - the draw for that particular lottery can take place. You may choose to be allocated either random (to a maximum of 5) or sequential ticket numbers - but you can’t select your own numbers. Each lottery has a jackpot prize, which continues to grow until won. Just like a raffle, each Lucky Lotteries Mega Jackpot has a set number of ticket numbers to be sold (180,000). Once all are sold - i.e., the lottery has been fully subscribed - the draw for that particular lottery can take place. You may choose to be allocated either random (to a maximum of 5) or sequential ticket numbers - but you can’t select your own numbers. Each lottery has a jackpot prize, which continues to grow until won. Visit our site and learn all the latest lottery strategies. 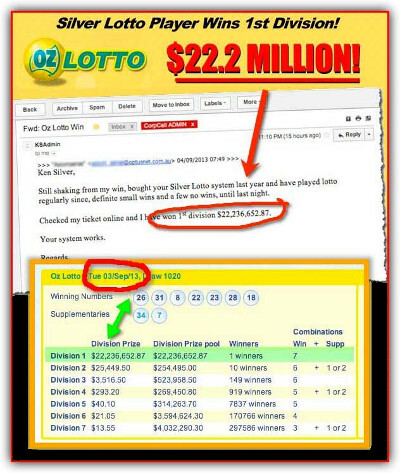 At www.lottery-winning.com we show you the real secrets of lotto winning. The professional company nycairportslimo provides all the information on NYC Airport Limo. If you are looking for online slots canada then learn more . It is so pleasant to work with experts. Visit this page to find out more regarding fun88 mobile. For additional local Agen judi online visit pialasports.